#PeopleOfPeace: WPU Professor, Amy White, Directs Raleigh Little Theatre's "The Revolutionists"
“The Revolutionists” runs from September 28 through October 14 in the Gaddy-Goodwin Theatre at Raleigh Little Theatre (RLT), and will include several members of the William Peace University community. 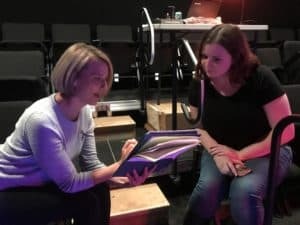 White, who has frequented RLT as an actor and educator, is joined on this latest production by WPU Musical Theatre seniors, Cheyenne Morris and Tiffany Lewis, both of whom are utilizing the experience for their senior internship requirements. Morris has flexed her leadership skills as the assistant director on “The Revolutionists,” while Lewis shows deft skill on stage as an actor. Additionally, Liz Webb, WPU’s Assistant Director of Admissions Operations and Technology, gives a heartfelt and hilarious performance in the show. “The Revolutionists” is a passionate and empowering story of four beautiful and uncompromising women who are re-imagined as the heroes of the French Revolution’s Reign of Terror. France’s fight for equality and freedom propels itself to modern times with this bold, brave, and blisteringly funny new work about feminism, legacy, and standing up for one’s beliefs. “The Revolutionists” plays at 8 p.m., September 28-30, October 4-7, and October 11-14. For ticket information visit, raleighlittletheatre.org. For more news and updates from William Peace University, visit www.peace.edu/news.